Here's another example of the quantum leap many bands managed in the early to mid-sixties. If you're not one of Hughesy's baby boomer peers, of course, there'll probably be another instance of rolling the eyes and muttering something about people banging on about the sixties and how everything was much better then. Actually, I'm not suggesting better. It's more a case of different and an environment that can't be duplicated, no matter how much you might be inclined to try. Consider the transformation of the Beatles from Love Me Do (written as far back as 1958) and She Loves You (Yeah, yeah, yeah) to Tomorrow Never Knows. You were probably expecting me to say Sgt Pepper's, but Tomorrow Never Knows, according to Ian MacDonald's Revolution in the Head was one of the first tracks cut for Revolver in early April 1966, less than three years after She Loves You (1 July 1963). That's a hell of a jump, and one you'll find replicated in many of the other acts that emerged in the sam time span. Now, I haven't trawled all the way back to the first Small Faces (twelve tracks, five covers, very much from the looks of it in the pop R&B mould), issued on Decca in May 1966 and recorded three months earlier, but I do have the Decca odds and ends exercise From the Beginning (fourteen tracks, six covers) and the jump from there to here is substantial. Not quite as substantial as the one from here to Ogdens’ Nut Gone Flake, but substantial none the less. Fourteen tracks, all original though there are a couple of finished versions of tracks that appeared on From the Beginning, playing time (in the original format) around half an hour. That, of course, refers to the original U.K. release. For the American market it appeared as There Are But Four Small Faces, resequenced, some tracks dropped and three singles (Itchycoo Park, Here Come the Nice and Tin Soldier) slotted in, and the CD version that ended up in my shelves has no fewer than forty-eight (count ‘em!) tracks, largely due to the presence of monaural and stereo versions of just about everything, and for a little under twelve dollars when I bought it (twelve months ago, currently “unavailable”) it was remarkable value. As far as I can see, there are at least three ways of looking at this. First, of course, you can look at the whole reissued package, bonus cuts, double versions and all, and conclude yes, it’s pretty good value for money if you don’t have the material already. That’s fine as far as I’m concerned. I didn’t, although I did have the singles thanks to a couple of other packages. On the other hand, strip out the extras, go back to the original fourteen track U.K. release and you’ve got a very interesting example of the speed at which things were evolving in the mid-sixties. There’s nothing here to match the heights subsequently achieved on Ogdens’, but you wouldn’t really be surprised by that, either. As a substantial advance on what had gone before it’s interesting enough in itself. 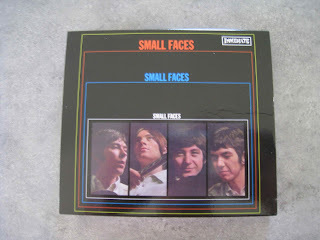 In mid-1965 Steve Marriott and Ronnie Lane had pinched the riff from Solomon Burke’s Everybody Needs Somebody to Love but needed someone to supply the words for what subsequently became Whatcha Gonna Do About It, and about twelve months later they’ve got that first Small Faces album. Run things on another twelve months and you’re looking at a much more experimental approach rather than a continued mining of the R&B vein. Looking at it from a twenty-first century perspective, there’s probably not that much that’s really remarkable here. Fourteen fairly short tracks, half an hour’s playing time. If someone whacked this out at full price in 2012 you’d certainly feel you were being short changed. As far as the actual contents go, most of it works pretty well, which is what you’d expect given a lead vocalist like Steve Marriott. Actually, that’s the point, isn’t it? There weren’t too many vocalists like Marriott, so the project gets a substantial head start in the vocal department. Not everything works as well as it might have done, of course. The opening track, (Tell Me) Have You Ever Seen Me is a bit overwrought lyrically. It’s one of those I know your face, but I can’t place it, so do you recognise me? situations that comes across a little clumsily (like that explanation). The work, for mine, of someone finding his lyrical feet. Much of the rest, Something I Want To Tell You (no surprises as to the contents of the desired message), Things Are Going To Get Better (Really? Who’d have thought? ), Become Like You, Get Yourself Together and Talk To You are pretty much as per the track title, but scattered through the contents there are a couple of little gems. My Way Of Giving (It’s all part of my way of giving and I’m giving it all to you) mightn’t be the greatest lyrical theme you’ve encountered, but it works a bit better than (Tell Me) Have You Ever Seen Me did, and Green Circles runs around in a pleasantly psychedelic manner. The first of the album’s real gems comes in the quite lovely All Our Yesterdays (though your mileage may vary as far as the Cockney intro from Mr Marriott is concerned, I reckon it gets old fairly quickly). Wonderful little Ronnie Lane vocal, quite charming. Better still is Ian McLagan’s Up The Wooden Hills To Bedfordshire, which is where things veer off into psychedelia again, even if they are (at least this is the way I’m inclined to interpret things) climbing the stairs so the protagonist can retire for the night. Finally, as far as the original content is concerned, the calypso tinged Eddie's Dreaming (Eddie being trumpeter Eddie “Tan Tan” Thornton, who toured with the band as well as working with the likes of The Beatles, The Rolling Stones, Georgie Fame and Jimi Hendrix), not quite psychedelia, but definitely working into the sphere of herbal enhancement, brings things to a pleasant conclusion. From that twenty-first century perspective, of course, an album where nothing runs over three minutes and several don’t make it to two suggests the buyer’s being shortchanged. The buyer could, perhaps point to Elvis Costello’s Get Happy! with a See? Twenty tracks! It can be done, but that was a decade later and a numeric generosity that raised quite a few eyebrows at the time. Padding things out, of course, explains the repetition and the bonus tracks thrown in, but if you’re going to make an objective assessment and fit into the milieu operating at the time, you’d probably say it’s an interesting exercise with hints of the greatness to come on Ogdens. File under: Signs of things to come.